I love my tea, but coffee is a very close second. It's up there...even may be tied to tea!! 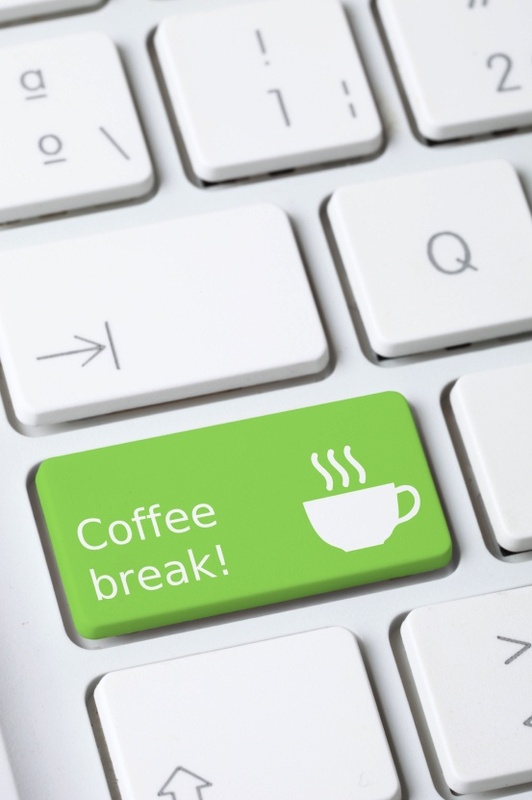 I thought this button would be great for those late night blogging sessions, where I hoped a cup coffee would just appear at my desk if I pushed that button. If you could add a button (any button at all) to your computer keyboard, what would it say? Let's hear it ladies. What are your thought on this Thursday?? Mine would say Kid Freeze. I'd press it and my children would all be in stasis (and blissfully quiet) until I finish the post. Ahhhhhh. I would have a botton that would say show me the money....LOL...Wouldn't that make life so easy. Gift for me. Every time I seen fabric online that I wanted, I would just push that button and then a few days later that fabric would show up in the mail. Backrub would be on mine. If we are dreaming... How about a button that you push and voila! you get an extra hour. I don't mean that you get an hour of time where you don't have to do something else, this is a whole new hour, so now the day had 25. Imagine the possibilities at holiday time! Haven't you ever wished for a few more days? "Feed Me Popcorn" while I type away, reading and then commenting on lots of blogs! Sweet iced tea with lemon. mine would say "get off the computer and sew". LOL I use the computer for inspiration but sometimes there is so much of it I never get to use any of those ideas as time is a precious commodity. mine would be--- Ding Dong "Hello Nanny"
Mine would be "add more minutes" (to the day}. The time sure gets away from me! I clicked here to say that I'd like to have a fold laundry button... But then, I saw that someone else mentioned naptime... So now, I'm completely torn. And wanting a nap. Hm. Bathroom break (also useful those nights where you wake up for a 3am tinkle and wish somehow, someone else could go for you) #am I the only one who gets annoyed by the call of nature mid crafting/painting/blogging/sleeping? Mine would sooooooo say "Maid to clean house"! Love that. mine would say Baby Snuggles. I think that's the one I want. Let's see mine would say........ milano cookies and cold milk! My button would be a refill of my ice water. OMG! You've got my button! Coffee, coffee, and more coffee,,puhleeeeze. Not a copy cat, honest. I'm make mine coffee, but the key would be aqua. "Sugar". In any form... preferably intravenously! I have a button on my calculator "I don't care!" "Dinner is served." (presumably by someone else!) ---not me.